When a US athlete falters, especially at a World-level event, their disappointment often blends with encouragement. It was a new experience. No one died. They had their say, realized everyone else in the tournament were mere mortals. The mystique is gone. Those refined foreigners, though sharply skilled, are comprised of flesh, blood, and bone just like they are. So it should be easy to understand why Nolan Baker (67 kg, NIRTC) and Carter Nielsen (82 kg, NMU/OTS) want another crack at the big show. 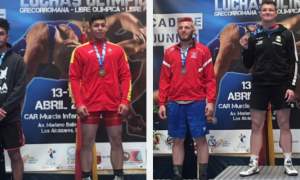 Both athletes competed this morning in their respective repechage rounds at the 2018 U23 World Championships in Bucharest, Romania and passionately and defiantly dug in for what promised to be an uphill battle. Baker, just like he had on Tuesday, provided glimpses of the scoring capability that has people excited about his future. Nielsen? Nielsen didn’t get much of a chance to show what he is made of yesterday, but he certainly did on Wednesday. 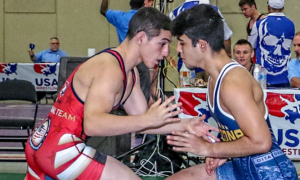 And although this was a tournament perceived to be shrouded in disappointment for the pair of promising Greco athletes, both insist they’ll be back. Day 3 of the 2018 U23 World Championships began at 10:30am in Bucharest (3:30am EST) and aired live in the United States on Trackwrestling. Baker’s assignment, Ryo Nakahashi (JPN), got on the board first with a takedown, and the Illinoisan defended follow-up attempts on the mat. Baker pulled out a correct-throw-arm-throw to jump ahead briefly on criteria, but Nakahashi reversed to get his point back. And again, Baker held firm, stopping Nakahashi’s try at a gutwrench. They returned to the feet and Baker went for a headlock, his principal maneuver. It was close, but Nakahashi stayed heavy and it was ruled a slip. Tenuous pummeling commenced. Baker’s main issue was that Nakahashi was repeatedly able to swim underhooks in on his left side. 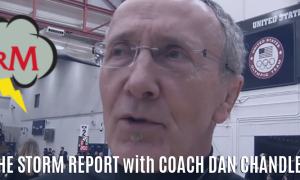 That led to some off-balances, which tend to make an impression on the officials. But the score entering the second period was only 3-2 with Baker, more than holding his own. Just one hit at offensive paydirt and he could seize control. Nakahashi’s left underhook went from being a problem to a catalyst. 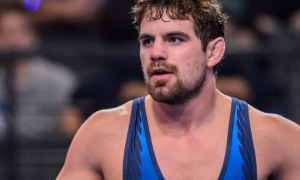 Baker crouched with his reciprocal overhook and headlocked the Japanese wrestler, netting four points. However, Nakahashi rolled through and was given two. And then Baker turned Nakahashi over again, and he got two. By the time the flurry had reached its apex, Baker was holding an 8-5 advantage. Nakahashi closed the gap with 1:40 remaining. He had cinched a front headlock and yanked Baker over. After the reset, Nakahashi did it again, this time bounding over the top. What was an 8-7 Baker evaporated. Nakahashi, now up 11-8, refused to let go of his lock and rotated Baker over once more to tack on an additional two. 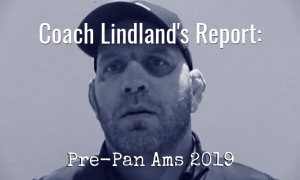 USA challenged the front-end of the sequence sequence, insisting that the initial front headlock should have been scored two, not four. A lengthy review followed, all for naught. The challenge was denied and Nakahashi required only two more points to end the contest. Which he did, but not before Baker got a few last swings in. In fact, that’s why Nakahashi was credited with a tech. With time close to running out, Baker swooped in towards the body and Nakahashi brushed away Baker’s arm, covering for the final takedown. Nakahashi won his next match against Meiirzhan Shermakhanbet (KAZ) and will face Hungary’s Otto Losonczi in the bronze medal match later today. Gegham Torgomyan (ARM) represented Nielsen’s first obstacle standing in the way of a bronze medal. The brunt of Torgomyan’s offense was logged early in the opening period. Although he kept a solid base, Nielsen got a little too extended and the Armenian pounced to pick up four off of an arm throw. The one element to this match that made for very intriguing theater was Nielsen’s approach. Because he was unable to expound upon his skill-set on Tuesday, it was as if he wanted to make sure he got his licks in this morning. He moved with conviction, dipping and darting in between pummeling for position. An angry arm throw attempt from Nielsen was immediately white-paddled, but it served to underscore his competitive attitude against Torgomyan. Torgoymyan wasn’t quite finished with his scoring in the first period. An exchange near the edge saw him reverse wrap Nielsen and pull him over for two points. Nielsen was none too pleased with the call, he felt that the action had began and ended when the pair was already well off the line. Nevertheless, the US did not challenge this sequence — but they did on the next. Just before the end of the period, Nielsen arched back with double overhooks and Torgomyan collapsed on top. The initial call was two — but this time, the USA challenged (and they had to) and won. Down 6-0 in the second period, Nielsen feverishly worked to open Torgomyan up. He was breathlessly going on the attack. But instead of being rewarded for bringing the action, he was instead penalized, as the referee awarded Torgomyan a passivity point. Nielsen could hardly believe it and had no choice but to laugh as he assumed the par terre down position. Upon the whistle, Nielsen first thought about basing out and standing. Torgomyan locked and loaded, but Nielsen urgently hip-heisted. From then on, he operated with a fury. Nielsen clashed back inside. Only a minute remained. He vice-gripped Torgomyan’s head against his own, torquing and pulling to generate a reaction. A lane opened up, and Nielsen briskly locked around Torogomyan’s body. It was a takedown right away, but Nielsen kept his momentum and instantly converted to a gutwrench. He needed another score. A lift would mean the lead, but even a turn would narrow the gap to a mere point. Surely, Nielsen could do something with such an opportunity despite the lack of time left to work with. So he squeezed with all of his might. Nielsen stayed with his gut and did manage to gain another rotation — but Torgomyan got just loose enough to avoid exposing. It had to be a sprint to the finish. Nielsen was the one possessing more juice. He went hard after Torgomyan, a near miss on a pair of attacks led to a one more spirited flurry. There was time, just not a lot of it. Torgomyan, on his last legs, somehow was able to fend off Nielsen’s charges, and it was he whose hand was raised as the victor of a 7-4 decision. The Armenian did not have much steam left for the repechage semifinal but recovered enough to give Mahdi Ebrahimi (IRI) a tough test, ultimately falling 2-1. The US, which came into this tournament having earned at least one medal in each prior World event this year, failed to win a match in Bucharest, going a collective 0-12. 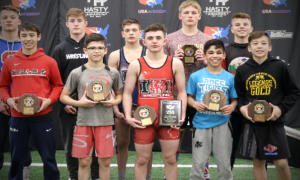 Four US athletes faced first-round opponents who had won World medals previously: Travis Rice (63 kg)/2017 Junior World silver Aleksandr Hrushyn (UKR); Baker/2012 Cadet World Champion Karim Jafarov (AZE); Jesse Porter (77 kg)/2017 World bronze/’17 U23 World Champion Fatih Cengiz (TUR); and G’Angelo Hancock (97 kg)/2017 Junior World Champion Vladlen Kozliuk (UKR). 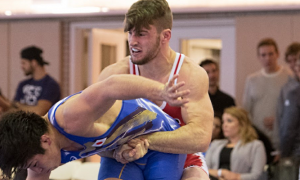 Dalton Duffield (55 kg), Baker, Nielsen, and Hancock were the only four USA Greco athletes who were credited with scoring offensive points. 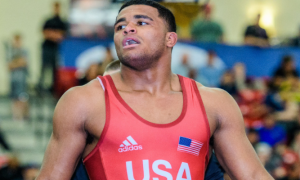 Rice, Porter, and George Sikes (87 kg, who lost to Anton Kurs of Belarus) were all defeated by eventual 2018 U23 World bronze medalists. Both Jafarov and Nicu Ojog (ROU), the two wrestlers who ousted Baker and Nielsen on Tuesday, respectively, are going for gold today. As mentioned, Nakahashi is in the bronze medal match.